Vacation Bible school (VBS) is a great blessing because it gives the church an opportunity to do what the Lord has called her to doproclaim the excellences of our life-giving Lord, fellowship with one another, edify God's people for growth and service, nurture our covenant children, and worship the Lord. From the earliest days of the Orthodox Presbyterian Church, vacation Bible school (VBS) has been a challenge. 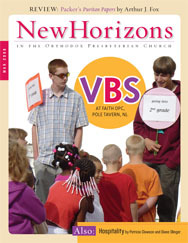 In the days before New Horizons magazine, a number of articles appeared in the Presbyterian Guardian encouraging churches not to give up holding VBS, despite the difficulty of getting people to say yes when asked to teach or serve. Everyone acknowledged that the time and effort put into VBS were enormous, not to mention the nervous exhaustion of teachers and volunteers who were already busy with life. If you break into a sweat at the thought of having a family over for Sunday lunch, or your pulse races when the minister asks you to host a missionary overnight, this article is for you. For over three million American Presbyterians, the Civil War ended on June 10, 1983, when the Northern Presbyterian Church (UPCUSA) merged with the Southern Presbyterian Church (PCUS) to form the Presbyterian Church (USA). The union was celebrated in Georgia, the state where the division occurred 122 years before.